The dots are beginning to form up. I’m starting to connect them. Of course, that doesn’t mean that the pattern that emerges is really there. Is the Big Dipper really there? Or is it really a Big Bear? Or just stars? What I’m looking at is the disappearance of animals from daily life and the rise of funny animal cartoons. Then we get nature films in the theaters and on TV and funny animals begin disappearing from cartoons. And then we have animal rights movements and animal studies begins showing up in the academy. Causal connection or mere historical sequence? Don’t know. For that matter, don’t really know if it makes sense as a mere historical sequence. But I’m thinking about it. So, there’s a big migration from rural America to the cities in the first half of the 20th Century. At the same time animation gets invented and funny animals take over cartoons. There’s an argumentthat there’s a causal connection between the two–see Evolutionary Alienation for pointers. Funny animal cartoons are somehow a reflex of, compensation for, the retreat of animals from our lives. Those cartoons were theatrical—had to be, as TV didn’t exist. They played before feature films, often as parts of integrated programs that included newsreels, short subjects of various kinds, cartoons, and two features, the main feature (an A movie) and a secondary feature (B movie). People of all ages went to see these programs. Cartoons weren’t for kids. What do you mean by that? you ask. Crudely put, we evolved in a world surrounded by plants and animals. We’re now headed pell-mell into cities where plants and animals are largely absent. And so we no longer fell at home. We’re alienated. We miss our friends and companions. And we’re not going to find them by cruising the web or watching CGI movies. Do you actually believe that? you ask. How the hell would I know? says I, I just thought of it. Two things: cartoons and community gardens. Many people agree with Lewis that voting is a sacred act, and some are organizing their religious communities—their brothers and sisters—to defend what’s previous. One of them is Nelson Pierce Jr. A doctoral candidate in the Micah program at New York Theological Seminary, he’s also the pastor of Beloved Community Church Cincinnati, and the lead organizer with The AMOS Project. As Nelson explains, for him, voting rights are a matter of faith. via The Ballot and the Bible: How Voting Can Be a Sacred Act | The Nation. The Transition movement is rooted in permaculture principles, which some people call “social permaculture.” Applied on a social level, the principle of observation leads to some important foundational questions. Where are we? What’s going on? Who’s involved? Where are we going? How are we getting there? How do we work together? This isn’t something that we can simply read articles about. We need to experience these questions together in shoulder-to-shoulder, hands-on kinds of ways (kind of like my tomato plants) to see—by trial and error- just what makes us lush, green and bountiful! Reading articles can ignite good ideas—but they have to be tried on, worn and felt. We have to experience what works and what doesn’t in order to make choices for our communities (and our gardens) that will give us thriving resilience. This means getting out there and doing it. It means shucking off the social isolation that, as Americans, we have unquestionably accepted for the past two decades. It means letting go of the concept of ‘rugged individualism’. The Transition movement is about transitioning away from overly individuated singularity toward an integrated synthesis. We, as individuals, will necessarily awaken to our roles as a part of the collective. We will reclaim our rightful place as ‘citizens’ instead of being merely content to be ‘consumers’. via The Tomato Incident | Vermont Commons. 3. What, then, is that alternative worldview, that “new civilizational paradigm”? In Why America Failed I lay out, unsurprisingly enough, the reasons for why America failed, and I say that it was primarily because throughout our history we marginalized or ignored the voices that argued against the dominant culture, which is based on hustling, aggrandizement, and economic and technological expansion. This alternative tradition can be traced from John Smith in 1616 to Jimmy Carter in 1979, and included folks such as Emerson, Thoreau, Lewis Mumford, Jane Jacobs, Vance Packard, and John Kenneth Galbraith, among many others. In England it is particularly associated with John Ruskin and William Morris, who argued for the need for organic communities with a spiritual purpose, for work that was meaningful rather than mind-numbing, and who did manage to acquire a large number of American disciples. In a forthcoming book by a colleague of mine, Joel Magnuson, entitled The Approaching Great Transformation, the author states that we need concrete models of a post-carbon economy, ones that break with the profit model of capitalism—and not in cosmetic or rhetorical ways. He gives a number of examples of experiments in this vein, ones that I would term elements of a steady-state or homeostatic economy: no-growth, in other words. After all, writes Magnuson, “permanent growth means permanent crisis.” Or as I have put it elsewhere, our job is to dismantle capitalism before it dismantles us. Again, this does not mean taking on Wall Street, which I don‟t believe can succeed. But it does mean leaving the field: for example, seceding. (Movements for secession do exist at this point, Vermont being a prominent example.) And if that‟s not quite viable right now, there is at least the possibility of living in a different way, as David Ehrenfeld suggests. My guess is that “dual process”—the disintegration of capitalism and the concomitant emergence of an alternative socioeconomic formation—is going to be the central story of the rest of this century. And I suspect that austerity will be part of this, because as capitalism collapses and we run out of resources—petroleum in particular—what choice will we have? via The Waning of the Modern Ages: Presented by Morris Berman at The Vermont Independence Party | Vermont Commons. in the long run, more and more political action which shift to cities and thereby ‘hollow out’ the increasingly sclerotic system of nation states which governs the earth and the global level. In a century the nation states will be husks of what they are now and most of the world’s civic business will be conducted by shifting coalitions of cities and regions. I’m interested in exploring that notion. Anyone have ideas, suggestions for things to check out, etc.? Any relevant science fiction? Mayors of Peace, an international organization of cities seeking to end nuclear weapons by 2020. Though I watched my mother tend to her flower gardens, I even helped her weed, and each Spring I looked for the irises to bloom, I didn’t become a gardener. For one thing, I never owned a home with grounds for a garden, though I could certainly have planted gardens in the house I rented in Cropseyville, NY, for two years or so. But I never had any such inclinations. Thus it comes as a bit of a surprise to find myself tending plants, pruning them, a bit of weeding, and a bit of watering. I like it. But what’s it about, this gardening thing? Here I’m thinking as an evolutionary psychologist, you know, the folks who believe that we’ve got Stone Age minds we’ve got to harness to operate the Modern World. And I agree with them, in a way. Our Stone Age ancestors didn’t garden, nor do our primate relatives. We all forage and eat plants, and we also do a bit of hunting for animal flesh, humans more so than other primates. We’ve got ‘instincts’ for those things. But we’ve got no gardening instinct. Nor for that matter, do we have instincts for quantum mechanics, archery, basket weaving, hopscotch, square dancing or bowling, among many other things. So how does our Stone Age mind do such things? On the one hand I’m involved in projects in my neighborhood (Lafayette in Jersey City, NJ), most notably a community garden, but also an anti-litter campaign, and I’m looking to do something with music. On the other hand I just got back from a trip to northern Vermont where I was part of a five-state aggregation of nine musicians that provided music for a conference on Vermont independence, which means Vermont seceding from the United States and establishing itself as a sovereign nation once again (Vermont was a republic between 1777 and 1791). What do these two spheres of activity have to do with one another? What are the connections? There is, of course, the fact that I’m involved in both sets of these arenas. I live in the Lafayette neighborhood of Jersey City and am working to make it a better neighborhood. Lafayette’s my home. I traveled to Vermont at the behest (when was the last time I used that word?) of Charlie Keil, an intellectual and musical compatriot. Charlie is an anarchist, as am I, and a pacifist, ditto. We were both conscientious objectors during our years of draft eligibility. And we’re both musicians. In particular, Charlie is interested in getting more people to make live music and he’s interested in what he calls a 12/8 Path band, which is a strolling brass band at home in 12/8 time. We’ve played many demonstrations together in New York City, including a large anti-war demonstration prior to the invasion of Iraq and an anti-nuclear demonstration where Japanese and out-numbered everyone else. But, how’s that get us to Vermont celebrating the future independence of Vermont? Simple, really. Charlie believes in “small is beautiful” and I’m OK with it. Breaking the USofA into a number of smaller and more flexible states seems like a reasonable thing to do. That’s something advocated by Thomas Naylor, an economist and an activist for Vermont independence. It’s Naylor who brought Charlie to Vermont and I came along. 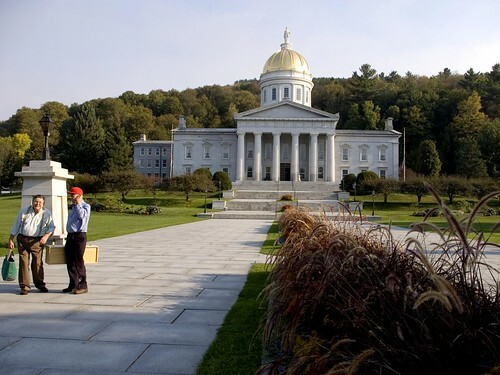 I spent Friday, 14 September in and around the Vermont Statehouse. Sometime back in the mists of history past some good Vermont citizens decided that, in the face of the cancerous growth of the American state, that Vermont folks of conscience and caring had to organize and urge their fellow Vermonters to secede from the Union. And so the Vermont Independence Party (VIP) was born. And Friday was their third state-wide convention, with visitors from several other states as well. This convention was organized toward the reading of The Montpelier Manifesto, listing 29 grievances against the Federal Government of the United States of America and urging secession. 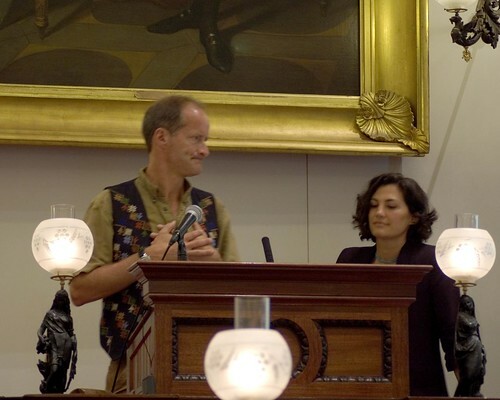 The conference was held in the House Chamber of the Vermont Statehouse, for it seems that, by law, Vermont citizens have the right to occupy use the statehouse when it is not otherwise in use. I was there with the Northeast Irregulars, a contingent of the New York Path to Peace, organized by Charlie Keil. We brought musicians from Jersey City, New York City, Connecticut, and Vermont. At least. Here’s some photographs of that glorious day. I apologize to all those who were there for the celebration but not in these photos. That’s Charlie Keil on the right and Jack Lazarowski on the left. Jack and his wife Linda put Charlie and I up for the night. Thanks, Jack and Linda! In previous decades, the Department of Energy drove basic research by operating giant government-funded labs, but under the leadership of Energy Secretary and Nobel Laureate Steven Chu, the agency has transformed itself into something different: the biggest, greenest venture capital firm in the world. In the book you describe a new federal agency, ARPA-E, a stimulus-funded incubator for alternative energy technologies that is the brainchild of Secretary of Energy Steven Chu. Can you describe how ARPA-E came into being? Grunwald: The stimulus didn’t create vast new armies of government workers at alphabet agencies like the WPA or CCC; ARPA-E was its only new agency, with a staff the size of a major-league baseball roster. But it’s a really cool agency, the kind of place where Q from the James Bond movies would want to work. It actually had its roots in the Bush administration, when Chu served on a National Academy of Sciences panel on American competitiveness that released a report called Rising Above the Gathering Storm; one of its recommendations was an energy research agency modeled on the legendary DARPA at the Pentagon. The idea was to finance out-of-the-box, high-risk experiments, like an early-stage venture capital firm. Congress authorized it, but never gave it money to launch until the stimulus. The early days at ARPA-E were pretty insane. Its first couple of employees had to put out its first solicitation, and it was inundated with 3700 applications for its first 37 grants, which crashed the federal computer system. But they attracted an absurdly high-powered team of brainiacs: a thermodynamics expert from Intel, an MIT electrical engineering professor, a clean-tech venture capitalist who also taught at MIT. The director, Arun Majumdar, had run Berkeley’s nanotechnology institute. His deputy, Eric Toone, was a Duke biochemistry professor and entrepreneur. Arun liked to say that it was a band of brothers; I like to think of it as a $400 million Manhattan Project tucked inside the $800 billion stimulus. via The ‘Silent Green Revolution’ Underway at the Department of Energy – Ross Andersen – The Atlantic.